One week ago we announced the awesome access you now have to my career, job search and soft skill video courses on Pluralsight. Today we’re announcing the Pluralsight Video Tracker, which is an internal tool on JibberJobber that allows you to keep track of which Jason Alba courses you have watched and get free JibberJobber premium upgrades for each Jason Alba course you finish. First: login to JibberJobber and click the link right under the menu. NOTE: if you close this box, you can still get access to the right page by clicking Videos, directly under the search box. Second: Once you click on that link, you’ll come to a page with an explanation of what all of this is about. 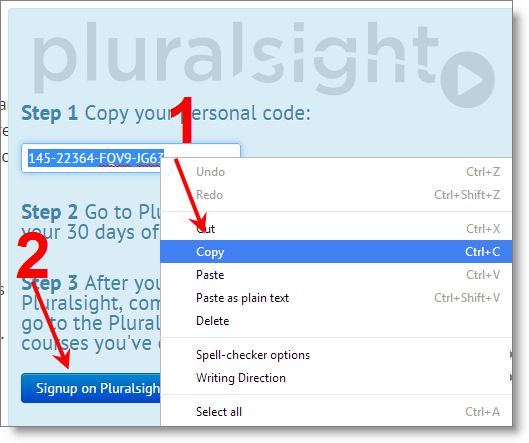 Note the blue box on the right, where you click to get your personal, unique code. Click that link and you’re on your way! Third: The blue box will expand and give you (1) your personal code… just copy that and then click the (2) signup button to go to the next page (which will open a new tab). NOTE: Step 3 says to come back to this page to turn on the tracker… we’ll get to that in a minute! Fourth: See how small that form is? That is IT! No credit card number, no commitment, no strings. This is awesome. 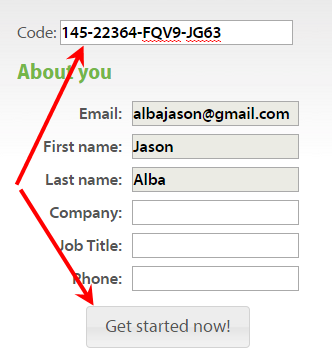 Just paste your code in the top box, fill out the form, and then click the button. If you don’t work for a company, don’t worry. Pluralsight wants you to know who they are, and when you land your next job, you can introduce your new team, your boss, etc. to Pluralsight. You now have your Pluralsight account, and the clock starts to tick on 30 days of unlimited access (which means, all of my courses, and the rest of the 4,000+ courses in the library). Fifth: Notice Step 3 turned into this link. 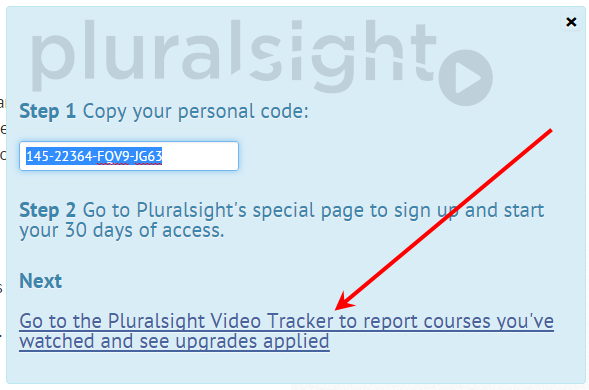 This takes you to the Pluralsight Video Tracker, where you can see what courses that qualify for more JibberJobber upgrades, and how to easily report each course you watched…. so, click this link. Sixth: Click the button to start the tracker… this starts the 30 day counter. If you sign up for Pluralsight one day, and click this blue button a different day, your days will be off. No big deal, just do the math in your head, or let us know and we’ll try to adjust it. This counter is internal to JibberJobber, and not coming from Pluralsight. 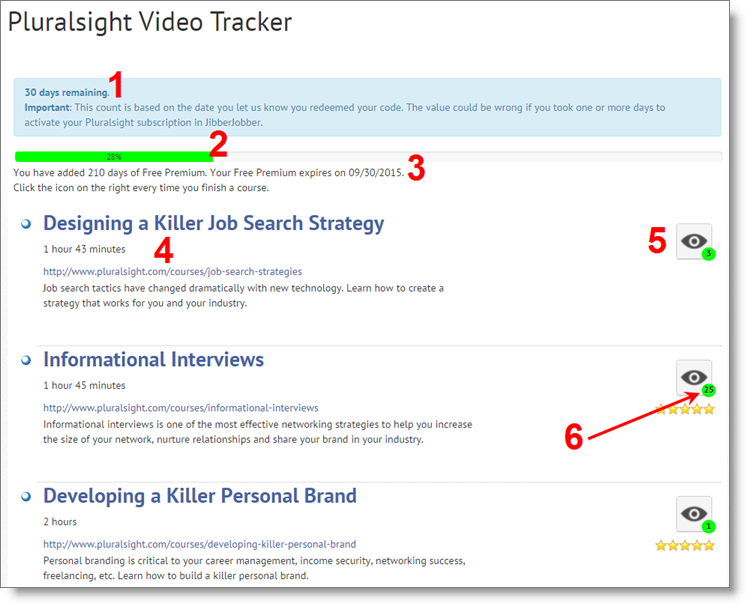 Seventh: Now that you have clicked that button, you see the tracker… below this image I will explain the 6 highlights. This shows how many days you have left, according to when you clicked the Turn on Tracker button. This is NOT tied directly to Pluralsight, so if you didn’t click it the same day you got your Pluralsight account, it might be off. This line shows you how many upgraded days you have received because of courses you have reported, and when you premium expires. If the math appears to be off, let us know! The left column shows the Jason Alba courses… you can click on the title or the link to get to that course. The order is a kind-of-logical-suggestion, but you can watch in whatever order you want. Note the counter, which shows how many times I’ve watched a particular course. You can see I’ve watched the Killer Job Search Strategy course 3 times, the Informational Interviews course 25 times, and the Killer Personal Brand course once. Each time you click the button the number increments, and you earn more JibberJobber premium. Of course, we reserve the right to audit any self-reporting. If you click 30 times today, we’re guessing you haven’t watched 30 courses in one day… we’ll have a conversation about that. If you did watch 30 courses, and report them all one on day… great. We simply ask that you be honest. Also, once you click 52 times, your submissions go into a queue that Liz will monitor. If you really watched the courses, you’ll still get your upgrades… of course. A Pluralsight user asked what happens after the 30 days. Every time you watch a Jason Alba course on Pluralsight, and report it on the JibberJobber Tracker, you get additional days of JibberJobber premium. Whether you came to Pluralsight through JibberJobber, or whether your company pays for your account, or whether you have had your own account for years… you earn these days. Can I leave discussions on the courses on Pluralsight? I’ve been told that yes, you can leave discussions and rankings, even if you are on the 30 day trial. Feel free to leave anything you want as long as it is honest I like to answer questions to courses on those discussion boards, as opposed to individual emails.